Claims development is the process of developing effective advertising and packaging claims that drive sales and strengthen brands. At AMS, we are uniquely positioned to serve as your end-to-end claims partner or to provide support anywhere in your claims process. As a firm, we help our clients to make informed decisions through data-driven insights. Our insights practice helps clients develop differentiated, effective claims that will resonate with consumers and that will succeed in the marketplace. Our litigation practice tests that claims are substantiated, and our team is prepared to defend tested claims in the event of a challenge from competitors, the NAD, or the FTC. Our two practices work seamlessly together to support the entire claims process, so that you have the confidence you need to move forward with powerful and defensible claims. 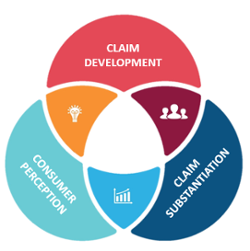 The AMS approach to the advertising claims process may include three steps: claim development, claim substantiation and consumer perception testing. It’s important to work with an experienced expert witness who is prepared to defend your study in the event of a challenge. AMS survey experts have participated in NAD challenges and worked on hundreds of advertising studies subjected to scrutiny from opposing parties. Our experience and understanding of ASTM guidelines for substantiation, NAD case law, and section 43(a) of the Lanham Act can help you avoid pitfalls and anticipate problems in your own research. Our experts help you work through issues around consumer perception ensuring that you consider all the likely take-away messages from the claim in the greater context of your advertising. Use claims development, substantiation and consumer perception testing to generate sales and bolster your brand. Learn more about developing effective claims that stand out.